At the northern tip of San Francisco's Presidio, Baker Beach offers spectacular views from outside the Golden Gate. Beach wheelchairs are available if you reserve in advance and can transport one here from Fort Mason. Lobos Creek Valley Trail •Trailhead: At the southwestern end of the Presidio Trust maintenance yard parking lot, which is on the east side of Lincoln Boulevard, across from Bowley Street and Baker Beach •Length: Under one mile total •Typical Width: 4 ft. & above •Typical Grade: Gentle •Terrain: Hard •The boardwalk sags a bit in the middle and shrubbery encroaches on it in places. 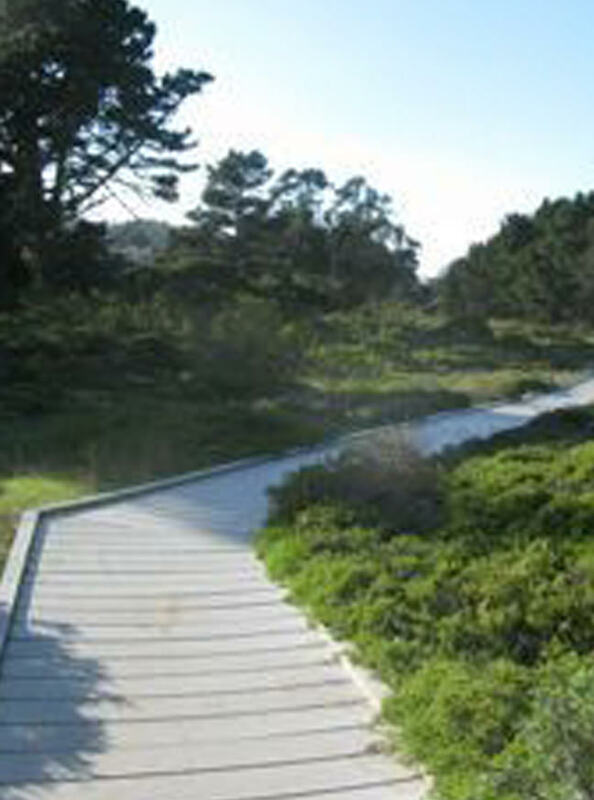 •Obstacles: No turnaround area at the end of the boardwalk Accessibility: •Beach Wheelchair: Yes •Beach wheelchairs are available for pickup at Crissy Field and Fort Mason, Building 201; five days advance notice is required. To reserve, you can send email via the NPS website or call 415-561-4958; (800) 877-8339 Federal Relay Service, (877) 877-6280 VCO, (877) 877-8982 Speech to Speech, (800) 845-6136 Spanish, (866) 893-8340 TeleBraille. •Accessible Parking: Yes •Several accessible spots are in both the north and south (oceanfront) lots at Baker Beach, and two are in the lot at the Lobos Creek Valley trailhead. •Accessible Restroom: Limited Accessibility •At northern and southern (oceanfront) parking lots. The restroom building in the northern lot has no 5' x 5' turnaround space except in the stall. •Accessible Picnic Tables: Limited Accessibility •One group of tables in the picnic area behind the restroom is reachable via an uneven and frequently sandy asphalt path. These tables do not have 27" knee clearance.